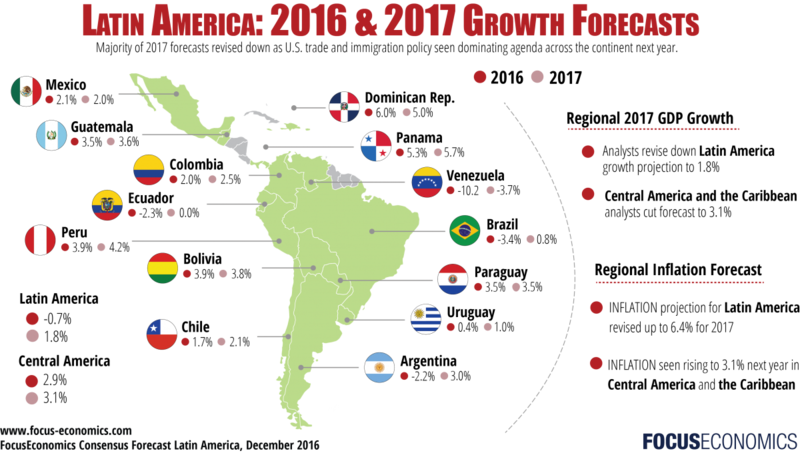 Latin America has been in recession for almost two years and it looks likely that come the end of this year, the Latin American economy will have been in recession for a second consecutive year for the first time since the "Lost Decade" of the 1980s. But could it be making a triumphant return to the top in 2017? 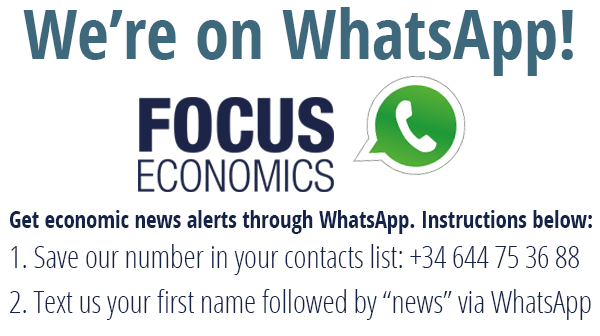 We take a look at the latest on the economy of Latin America below. What does Trump mean for Latin America? The result of the U.S. presidential elections has called into question the future of U.S.-Latin America relations. Although President-elect Donald Trump did not articulate a detailed foreign policy approach towards Latin America during his campaign, trade and immigration—two of the key topics of the Trump campaign—are likely to dominate the agenda across the continent. Mexico is expected to be the hardest hit, and this goes beyond Trump’s relentless promise that his administration would build a wall between the two countries to stem the flow of illegal immigration. South American countries will be off the administration’s radar, although there is a high risk that protectionist policies could damage some of the countries’ agricultural exports to the U.S.
Investors in Mexico are nervous about Trump’s protectionist policies, and this was quite evident when the peso took a plunge on election day and fell further immediately thereafter. The currency, which had acted as a barometer throughout the presidential campaign, took the largest nosedive on record as it became clear that Trump’s promise to renegotiate the North American Free Trade Agreement (NAFTA) and build the now infamous wall could come to fruition. For now, the shock has been felt in consumer and business confidence, which could have some near-term effects in the form of weaker household consumption and reduced fixed investment. Should Trump follow through on his pledge to modify NAFTA or impose trade barriers, Mexico’s economy will be affected substantially as the economic ties between the two nations are strong, owing largely to NAFTA. The long-term effects on Mexico will largely depend on the extent to which Trump pursues his protectionist agenda. Other trade relations could also be affected, in fact, it was recently announced that the Trans-Pacific Partnership (TPP), a free trade agreement (FTA) that incorporates 12 countries, including Chile, Mexico and Peru, has been abandoned. The U.S. already has FTAs with Chile and Peru, which have escaped Trump’s anti-trade rhetoric so far. Nevertheless, that the President-elect has given no attention to those treaties may reflect that manufactured exports from these countries to the U.S. are quite low, although the TPP would have helped to facilitate easier access to the American market for such exports. The United States has had little engagement with South American countries, despite President Barack Obama’s promise of a “new chapter of engagement” with the country’s southern neighbors and improvements in trade facilitation. South America, Brazil in particular, appears to be out of the line of sight of the new administration and it is unlikely that there will be more active policies under Trump’s government. Nevertheless, U.S. agricultural companies lobbying Trump to introduce tariffs and non-tariff barriers on certain products represents a greater risk to South American economies. Tariffs on raw materials such as ethanol and steel could hurt Brazil, while greater U.S. protectionism against imports such as soybeans and other grains could cloud the outlook for U.S.-Argentina relations. A potential hot spot is Venezuela. Despite years of anti-American rhetoric by former Venezuelan President Hugo Chávez, there was little conflict in practice. The U.S. is Venezuela’s largest export market and the Obama administration largely ignored verbal provocations by Hugo Chávez and Nicolás Maduro. However, this may change with Trump in power given that he wants to appear strong on the world stage. If this turns out to be the case, Maduro risks significant fallout if he continues to blame the U.S. for Venezuela’s misfortunes as Trump could be more likely to take retaliatory measures. Regarding Central America and the Caribbean, there was little in the Trump campaign specifically directed against the economies that belong to the Dominican Republic-Central American Free Trade Agreement (DR-CAFTA). Instead, the main economic risk to these economies would be through the immigration channel, given their heavy dependence on remittances from workers living in the U.S. Along with Mexico, these countries would be the most vulnerable to any change in the U.S. immigration policy, whether to strengthening the surveillance at the U.S. southern border—or the building of a border wall—or any attempt to deport about 11 million undocumented workers—most of them Latinos—in the U.S. Mass deportation is, however, deemed to be logistically impossible, yet the threat has the potential contribute to tensions between the U.S. and the region that would be a detriment to cooperation in other areas, such as security and the eradication of illegal drug trafficking. On the bright side, Chinese President Xi Jinping embarked on a week-long visit to Latin America in mid-November that included state visits to Chile, Ecuador and Peru. Xi Jinping’s visit immediately followed events in the U.S. that have called into question the future of U.S.-Latin America relations, and highlights China’s emergence as a key trading and investment partner for the region. China signed several trade agreements with the aforementioned countries and appears open to the possibility of expanding its array of FTAs in Latin America just as major economies in the region are keen to purse more trade deals, and also at a time when the possibilities of developing stronger trade links with the U.S. and Europe appear increasingly difficult. Should the region embark on deepening trade agreements with China, a key priority will be the diversification of trade in order to reduce reliance on commodity exports. 2016 marked a more challenging year for Latin America. After having stagnated in 2015, the region’s economy began to contract in early 2016 and the recession persisted through the third quarter. A regional aggregate estimate shows that Latin America’s GDP contracted 0.9% annually in Q3, which followed a 0.9% decrease in Q2. The result suggests that the region is starting to slowly emerge from recession. Nonetheless, economists project that this year Latin America will register its worst economic performance since the global financial crisis hit in 2009. Economic experts expect that the economy of Latin America will contract 0.7% this year, dragged down mainly by the deepest recession in decades in Brazil, the sharp economic contraction in Argentina resulting from its painful adjustment to new policies, as well as due to the most severe economic crisis in Venezuela’s history. Next year, the region’s economy is expected to record a modest recovery, which is plagued with risks that are causing a downward bias for analysts’ growth forecasts for the region. Economists expect Latin America’s GDP to increase 1.8% in 2017, which has been lowered by 0.1 percentage points from last month’s forecast and contrasts the 2.4% growth that was projected in January of this year. Economic data has been stubbornly weak across the region in 2016 and growing uncertainty surrounding the global outlook in the aftermath of Donald Trump’s victory is weighing on the region’s sentiment, adding to concerns over the prospects for a recovery next year. The prospects that a Trump presidency might be both protectionist and in favor of a substantial fiscal expansion has altered expectations for U.S. monetary policy. Therefore, weakness is looming on the horizon for several currencies in the region, raising risks to a further tightening of monetary policy across the board. Looking at the countries in the region, economists cut the 2017 GDP growth forecasts for 6 of the 11 economies surveyed, with notable revisions to Argentina, Brazil and Mexico. They maintained the forecast for four economies, including Chile and Peru, and improved the outlook only for Ecuador. See the rest of the Latin America regional summary for December here.